Every year it is the same…”back to school” ads in the paper and on TV, every store window looks like the perfect dorm room, there are fewer school-age children at our favorite daytime play places and, last but not least, my Facebook newsfeed is filled with “first day of (fill-in-the-blank) grade” pictures of happy, new clothes-clad, chalkboard-holding school children. Phew! It’s only the 2nd week of school and I’m already exhausted! 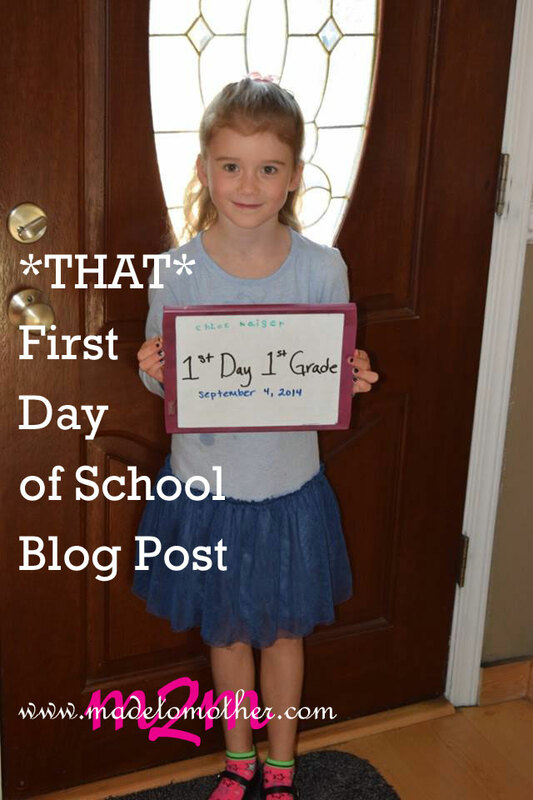 Not to mention, I cried like a baby when she and my husband left on the first day and I stayed home with the younger two (a scheme we devised last year on her first day of kindergarten so I wouldn’t exhibit said crying at the school and embarrass my big girl). Ironically, however, when I assumed the task of dropping her off on the SECOND day of school, the crying fit came anyway. Aaaaand, to make matters worse, I feared all day long on the first day that I had forgotten to get her. 11:40 rolled around and as I’m making the other two lunch, I panicked thinking I should have left to pick her up already, only to remember that I still had over THREE MORE HOURS. Geeeez! My days have never felt so long! How am I going to last another nine months of this! Forget that, how am I going to last the next 12 years?!! There’s hope for me, right?! I’m ready for this, yes? (No.) YES! I wish I could offer you some assurance as a mom who’s been there, but I haven’t been there yet! My older son is 3 1/2. So no school yet. However, I do enjoy seeing your perspective as I’m thinking about the years to come and trying to prepare my heart! What a beautiful picture of your daughter! I was a nanny and while the little girl being gone was sad, it was such a good experience for her. Also, going to pick her up with her brother, my nephew, was always a highlight of our day. And my niece loved her school so much, which helped too. Since I still only have a toddler and we haven’t had any other children yet, I’m perplexed at what might happen if/when I send Baby Boy away for any reason. Despite the fact that we plan to homeschool, I’m still not really sure how even that will work because, well, because I wonder if school has to be a thing. Then again, as you so mentioned….everything bleeds together when you’re home with littles that are also home! I love the way your voice comes through in telling this story, how you bring us from where you’ve been to where you are now with schooling, and the honest struggles of your mama heart. I have to say, I got a good chuckle, too, over how I guessed you lived in Portland before you even said it. That show, Portlandia, really isn’t all that exaggerated ;-D I live just north, in Seattle, and we’re not all that different… but perhaps a little less hippy. Thanks for sharing this story with us and grace to you on this journey. Don’t worry! You’ll get used to the extra time in no time! It sounds like a great school – around here there are schools that won’t even send the kids out if it looks like it MIGHT rain, or if it rained the previous day, so she’s lucky to get the art & outdoor time! Since I’m a Portlander I want to know more about this hippie charter school you speak of! I’m happily here from Lyli’s linky. YaY Portland! I hope you all have a great school year! My two older daughters are school age, and when school starts again I also periodically have one of those “did-I-forget-someone” moments of panic! It takes time for the new routine to feel normal, but it will happen! Dropping by from the Shine blog hop — greetings! Deep breaths. Deep breaths. I can’t imagine… I homeschool my kids but one day the day will come… I think I’ll fall over from the anxiety! Thanks for sharing this at my #Blirthdaybash! I’m so glad you took the time to celebrate with me. Thanks for joining in with this week’s parenting pin it party! Mine are now 13 and 17, so most of those years are behind me. Cherish them! I have, but I also believe that the Lord has a way of preparing us mentally to be okay and even ready and excited for the changes that come when we eventually become empty-nesters. I hope you all have a great year! Darling picture. My little ones started kindergarten this year and it has been an adjustment. The time seems to fly!! Thanks for stopping by Let’s Get Real this week!! Be sure to come again!